Place in glass baking dish or even a cookie sheet would work. Add a bit of sea salt and black pepper if desired. Roast in 375° F. oven until soft. Can put under broiler to brown it a bit if desired. Cayenne pepper flakes if desired. 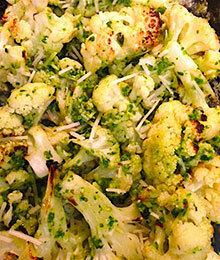 When Cauliflower is done, remove from oven and add about 1/3 to 1/2 cup of the pesto and 1/4 cup shredded parmesan cheese. Toss to coat and serve!